Your smartphone is a natural partner for your bike, especially if you're serious about commuting or training — most phones come with a flashlight, and apps for training, navigating, and video. 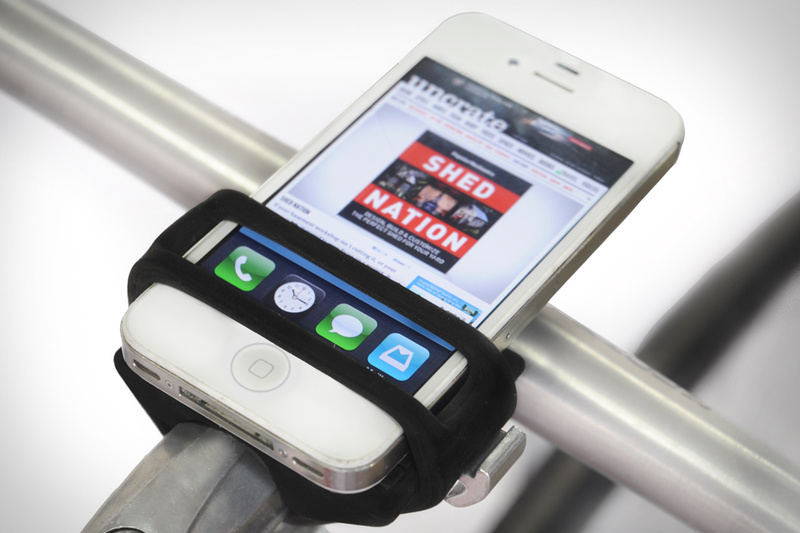 The Handleband ($25) is a flexible smartphone mount for your bike that accommodates a range of devices, gives you access to your phone, and allows you to position it within view or for use as a headlight (it even has a built-in bottle opener). It's made from aluminum and premium silicone, so it's durable enough to handle just about any terrain, and flexible enough so you can easily remove it. Can't find a babysitter for the track weekend you've been planning for months? No problem — take junior along for the ride with this Recaro ProRide Convertible Car Seat ($220). With side-impact protection inspired by racing technology, this car seat features enhanced head wings and reinforcement at the sides, hips, and thighs. An easily-adjustable five-point harness (just like the one you're probably wearing) means this seat can adjust with your kid as he grows, while a comfortable, ergonomic seat molds to fit his body. Available in range of colors and fabrics, this seat is easy to clean in case the Gs start to get to the little guy. Safely navigate in your car without taking your eyes off the road using the Garmin Head-Up Display ($135). This portable projector beams navigation information from your bluetooth-equipped smartphone onto a reflective film on your windshield, allowing you to see turn-by-turn directions, time of arrival, distance to the next turn, your speed, the speed limit, traffic information, and more. Just wirelessly pair it with your phone, put your destination into one of the compatible apps, and go. Availability pending approval by the FCC. If you're in the market for a rewarding summer weekend project, then check out the Balmain DIY Sailboat Kit ($2,590) — it has everything you need to build a fully-functioning small sailboat in your backyard or garage workshop. The kit comes with all of the wood, hardware, sealant, and glue you need, along with a sail, ropes, mast, boom, and gaff. A step-by-step instruction manual with detailed construction notes will walk you through each step of the process. All you need to provide are some simple hand tools, aquatic paint, and elbow grease. Also, a nearby body of water wouldn't hurt. Occasionally a machine can be more than just a functional hunk of metal and grease — it can be a work of art, showcasing craftsmanship and design. The Vandeyk x Rapha Continental Bike ($TBA) is just such a machine, built as a partnership between talented, creative folks. Handmade and TIG welded in Germany from Columbus XCr Stainless Steel tubing, this highly-limited piece displays just what happens when designers and builders come together to make something beautiful. The bike stands out as a completely-original piece with a black, pink, and purple custom paint job, disk brakes, a higher tire clearance, and a longer seat. If you've got a few extra bills burning a hole in the pockets of your flight suit, err cargo shorts, and you don't feel like waiting in line for a G6, it might be time to consider pre-ordering a Saker S-1 Personal Jet ($7,000,000). Sure, it's a bit on the pricey side, but you can't put a cost on the time you'll save traveling across the country at Mach .99. (With a 5,000 hour TBO on the engines and an operating cost of $2 per nautical mile, it's actually pretty cheap to run.) And, even though it looks like a jet fighter, you don't need any special training to fly it — good news for your G6 pilot. A longboard can be a great way to maneuver the city — lightweight, agile, nimble — but anything more than a stair or two presents a difficult challenge to overcome, except for the Stair-Rover ($360). This longboard has eight wheels, instead of just four, that move independently, allowing it to "scuttle" down a set of stairs relatively smoothly. It's great on uneven terrain like potholes and cobblestones, and rides just like a regular board on smooth pavement. Get yours with a maple or fiberglass deck, black or white chassis, or order the chassis separately to add to your favorite deck.